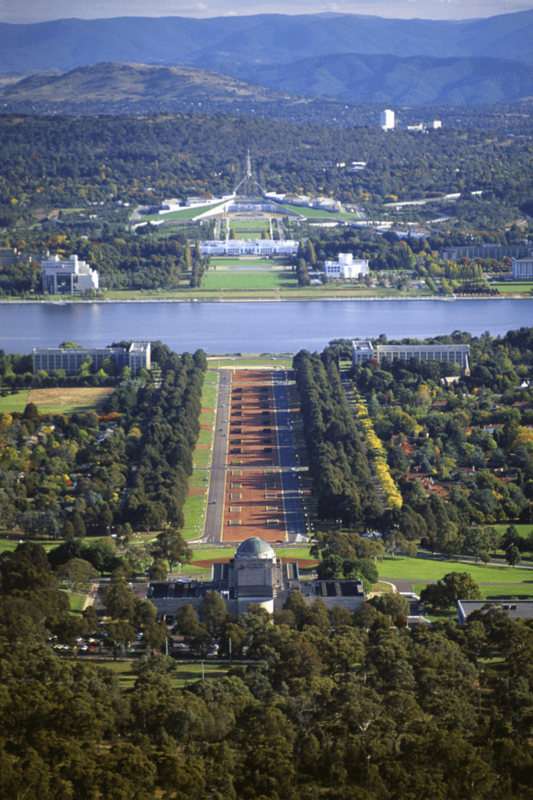 With a population of over 380,000, Canberra is Australia’s biggest inland city. 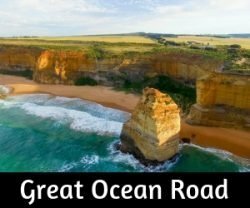 Located 287 km south of Sydney. 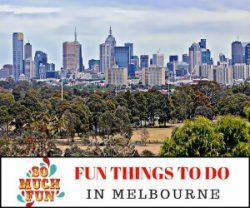 The location for the Nation’s Capital city, and home to the Australian Parliament was chosen in 1908 and is unusual in that it was planned outside of the existing states. After an international city design contest was held, the plan by Chicago architects Walter Burley Griffin and Marion Mahony Griffin was chosen, construction commenced in 1913. When first entering Canberra, it is easy to ponder where the folk who live, work and play in this well laid out and clean city actually hang out and shop etc. 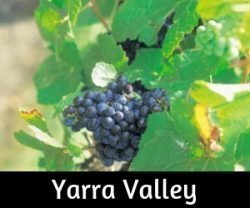 The main roads in and out of Canberra are tidy and free from the usual conglomeration of shopping strips, malls and large retailers. Everything seems to be neatly tucked away, hiding from visitors. 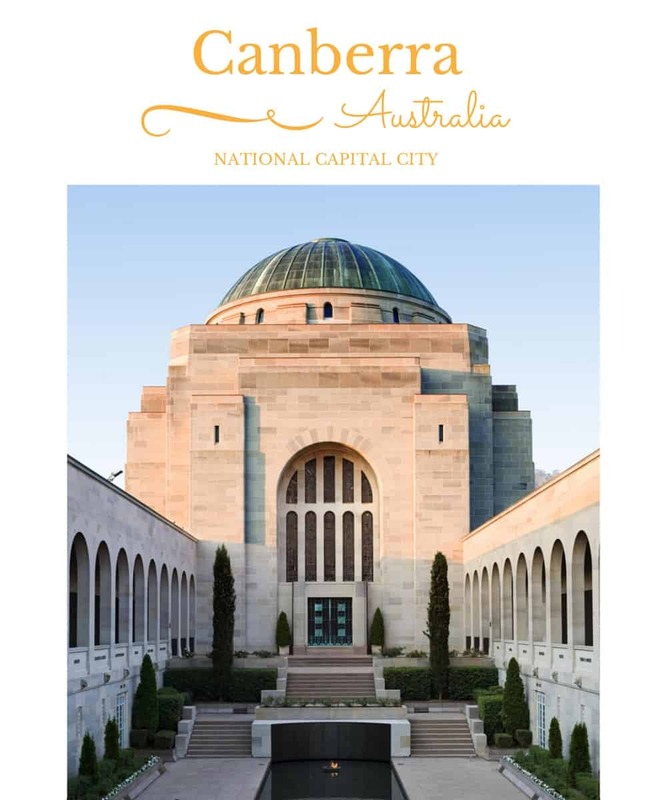 Make sure to collect a map and information from the Tourist Centres on entering the city boundaries as this will give you an insight into the layout of Canberra and where to find the shops, restaurants and nightlife as well as the attractions that the A.C.T. is famous for. Construction of the current Parliament House began in late 1980 and the building was officially opened on 9 May 1988, by Her Majesty Queen Elizabeth II. 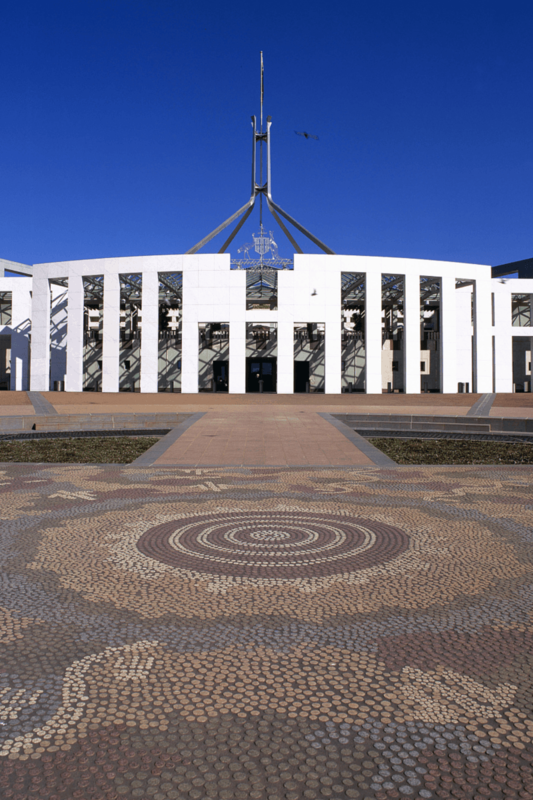 The new Parliament House was built to support the work of Australia’s federal Parliament for at least 200 years. Original Parliament House – known formerly as the Provisional Parliament House, was the house of the Parliament of Australia from 1927 to 1988. The building was used from 9th May, 1927 as a temporary base for the Commonwealth Parliament after its relocation from Melbourne to the new capital, Canberra, until a more permanent building could be constructed. 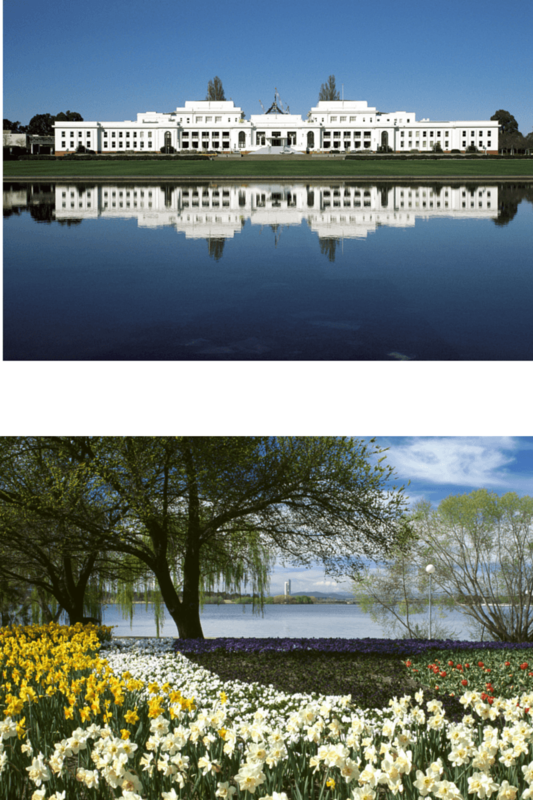 In 1988, the Commonwealth Parliament transferred to the new Parliament House on Capitol Hill. View towards Parliament House, Canberra with the War Memorial in the foreground. 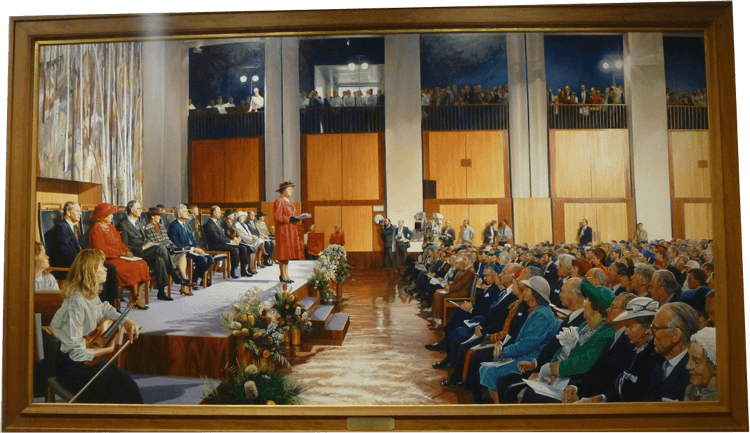 The opening of Parliament House by Her Majesty Queen Elizabeth II on 9 May 1988 by Marcus Beilby. his huge painting hangs in the Parliament Building, open to the public. 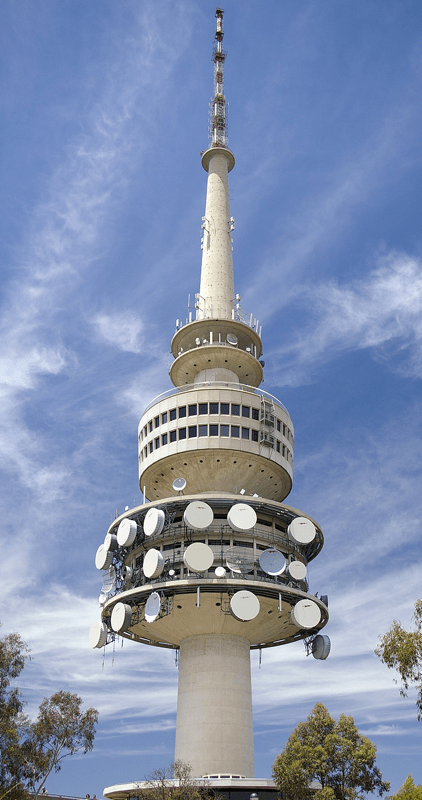 Telstra Tower was officially opened on May 15, 1980 by the then Prime Minister, Malcolm Fraser. Built on the summit of Black Mountain Canberra, it soon became known to the locals as Black Mountain Tower. 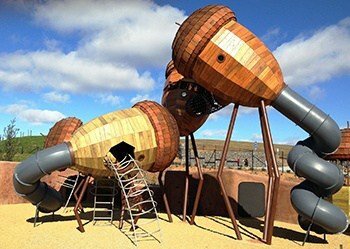 The Pod Playground, National Arboretum, a unique playground featuring banksia cubby houses, acorn-shaped pods connected by rope tunnels and tube slides; a discovery trail and climbing nets. National War Memorial “The Australian War Memorial combines a shrine, a world-class museum, and an extensive archive. The Memorial’s purpose is to commemorate the sacrifice of those Australians who have died in war. Its mission is to assist Australians to remember, interpret and understand the Australian experience of war and its enduring impact on Australian society”. Canberra’s National Arboretum is located on a 250-hectare site just 6km from the centre of Canberra, Australia and near Lake Burley Griffin. With an aim to become one of the greatest arboreta in the world, the Arboretum is a place of beauty with forests featuring trees which are threatened or rare. 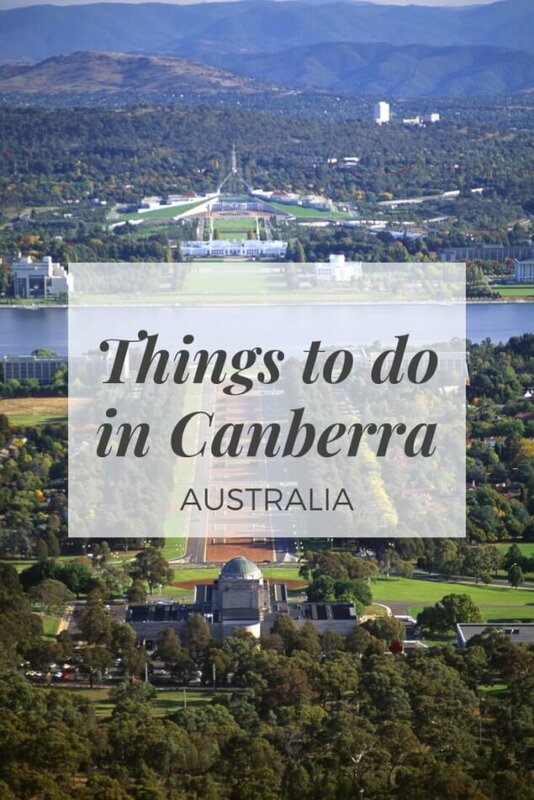 First opened in February 2013, the Arboretum is attracting many visitors from Canberra, Australia and around the world. It is already contributing to the protection of tree species and tree diversity worldwide, as well as generating new research and understanding of how trees grow, survive and adapt. The Testra Tower on Black Mountain is well worth visiting, prices for admission are not overly expensive and the views are stunning by day and night. National Gallery of Australia Vision: The cultural enrichment of all Australians through access to their national art gallery, the quality of the national collection, the exceptional displays, exhibitions and programs, and the professionalism of our staff. Purpose: The purpose of the Gallery is to serve the public by enhancing understanding and enjoyment of the visual arts. National Museum of Australia Land, Nation, People: “The National Museum of Australia is a social history museum. 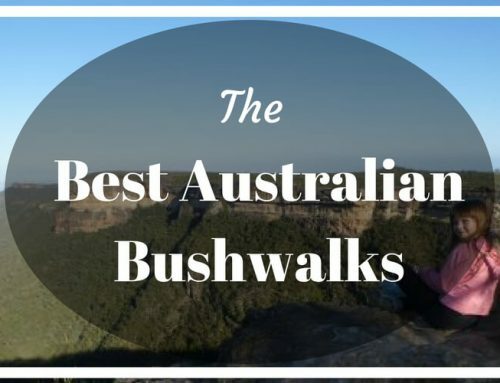 We explore the land, nation and people of Australia. We focus on Indigenous histories and cultures, histories of European settlement and our interaction with the environment’. Questacon “At Questacon, we strive to promote greater understanding and awareness of science and technology within the community. We’re committed to making that experience fun, interactive, and relevant”. 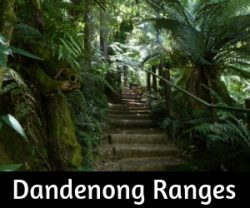 26 Free Things to do in Canberra by the Travelling Pinoys is a really extensive article on Canberra and will keep visitors busy for days.